Many thousands of waders congregate on the beaches and intertidal mudflats of the Dee estuary and north Wirral coast during the winter months. 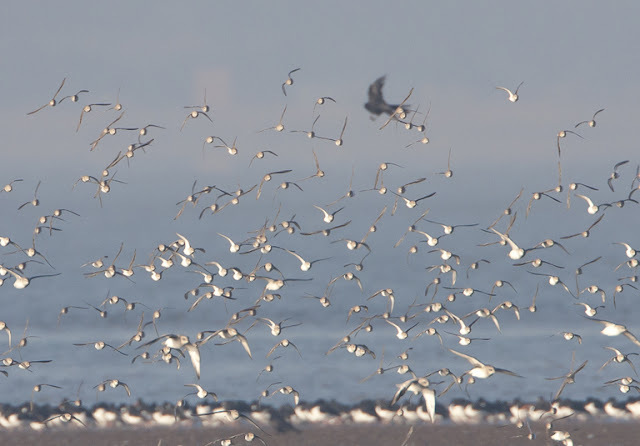 These birds have to survive here until spring, but not only survive; they must also gain enough weight to migrate to distant breeding grounds, some species making arduous flights over huge tracts of open ocean. Also, they need to arrive in good condition so they can successfully breed in a brief arctic summer. To survive our winter they must avoid death by starvation, disease or predators and there are factors that will exacerbate these risks to their survival. A key one is disturbance. There are natural forms of disturbance. Raptors such as Peregrines will kill very few of these birds but the repeated attacks will disturb their foraging. 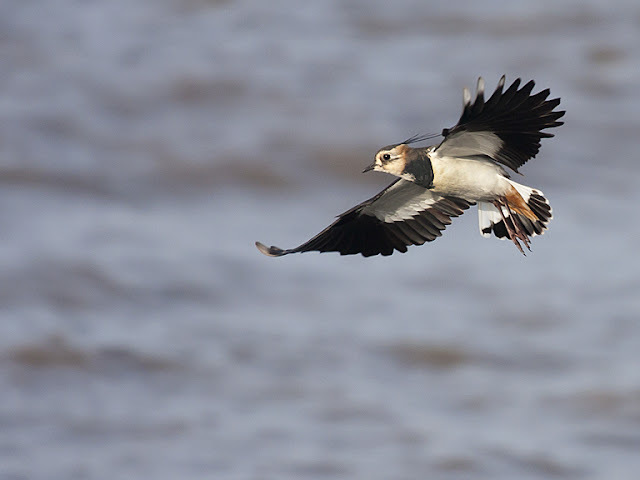 Disturbance to foraging can cause the birds to fly up and sometimes leave the feeding area altogether. This will lead to the unnecessary consumption of precious energy and repeated incidents of disturbance can reach critical levels for the survival of some species. 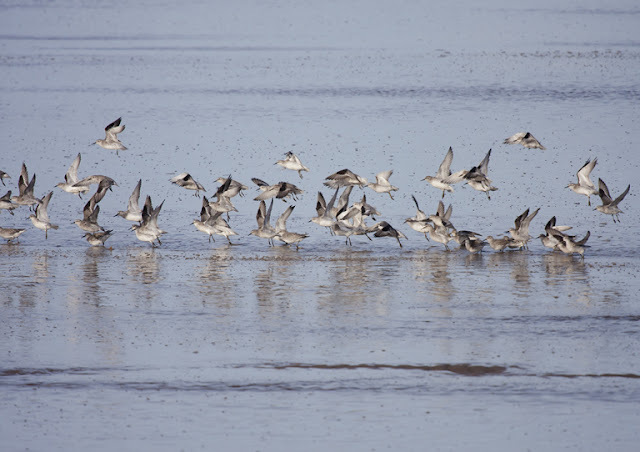 It can also cause the birds to move to less suitable feeding areas where there maybe increased competition between them and other shorebirds for food. 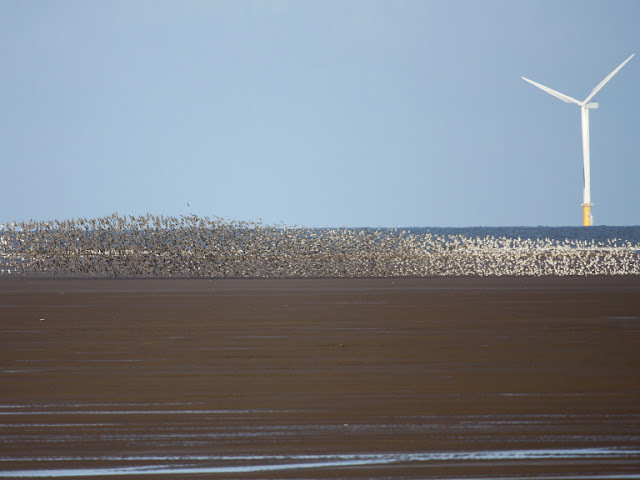 If disturbance on prime feeding and roosting sites is frequent and prolonged then movement to the less desirable feeding areas increases and prey will be depleted faster leading to more competition and an overall reduction in fitness of the birds. It is also possible that these areas may be more vulnerable to attack by predators or may be more polluted thus increasing the chance of sickness and disease. This is not my opinion, the above information was gathered and analysed by fair scientific tests and the article that I read it in was independently peer reviewed before publication in a leading scientific journal. 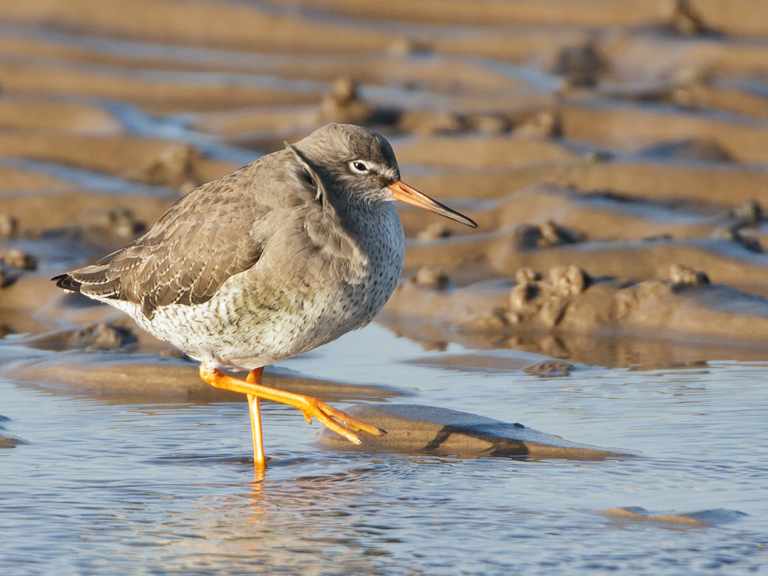 What we can take from it is that disturbance to wading birds in the winter can damage their fitness and in some circumstances can reach levels that are potentially fatal. In my opinion I believe that unnecessary disturbance is a bad thing and should be avoided if at all possible. Disturbance from predators is unavoidable. From humans though, it is. 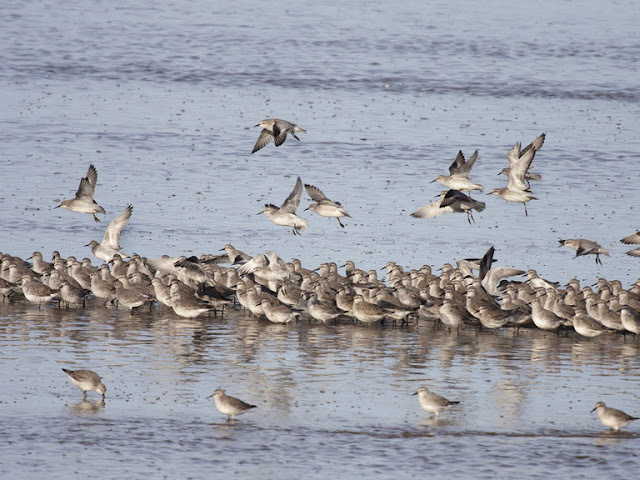 This past Sunday there was an awful lot of unnecessary disturbance to the waders trying to roost on Hoylake beach and some, but by no means all, was by people who should have known better. I am not saying that we should close the beach to people/dog/horses/kites etc so that the birds can have a nap. I am more than happy to share the beach with others and respect their right to exercise animals and pursue beachside hobbies different to mine! There are only really a few times during the winter when tides are high enough and fall in the middle of a busy weekend day when large numbers of birds will be competing for space with us humans. Our local Dee Estuary Voluntary Wardens do a sterling job in informing visitors about the birds on the beach and the effects of disturbance on them. Happily, many people do respect the birds whilst using the beach, some who are unaware of the damage done to the birds when they are disturbed are happy to look out for them in the future after talking with the Wardens. There are some people who will never alter their behaviour to stop scaring the birds and while I find it a little selfish, I can accept this. What I find unacceptable is disturbance from people who should know better, those who should be setting an example. By this I mean birdwatchers and photographers. I am both of these things and feel let down by those who behaved poorly at the weekend. Getting too close to the birds is not on and neither is using the odd irresponsible dog walker as cover for walking up to roosting birds, they are not a shield to deflect criticism of bad practice and lazy fieldcraft. 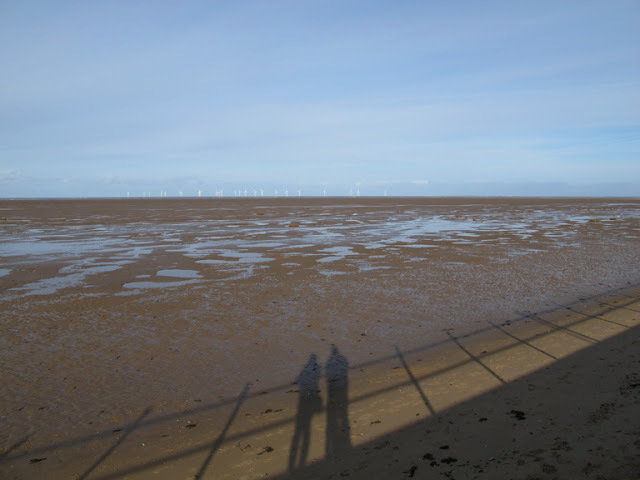 I was out that day, walking from West Kirby to Leasowe as the tide rose, enjoying the sun, the wide open beaches and spending time with my wife and the birds along our coast. In the picture above we are on the prom. It is possible to get some good pictures from here without having to drop down on to the beach and get, ultimately, too close to the birds. All of the pictures in this post were taken from the prom. As we wandered down in the direction of the lighthouse we passed a thin finger of rock armour poking out into the sea. On it was a mix of shorebirds roosting while the flats were being refreshed by the now risen tide. 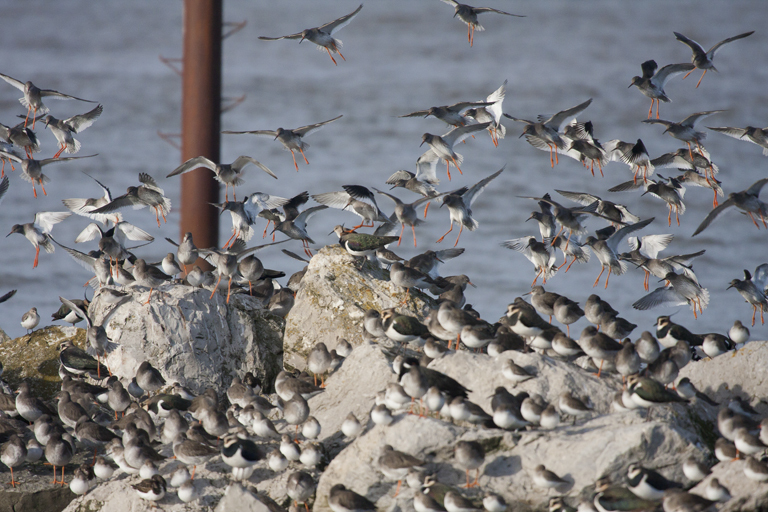 As waves broke over the tip of the groyne birds were pushed closer to our vantage point on the embankment. 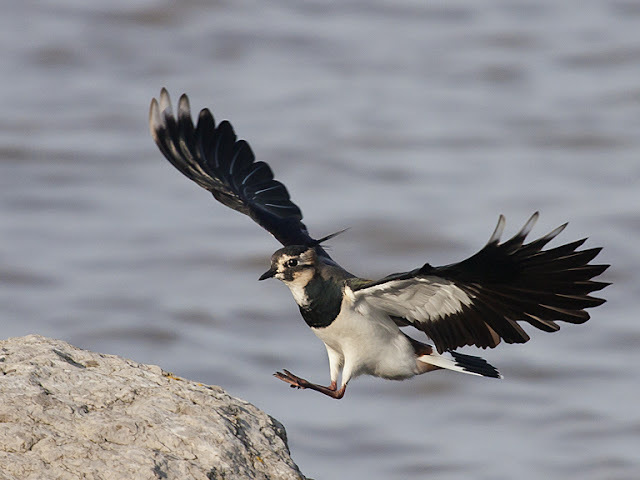 By just sitting quietly on the pathway I was able to get a few pleasing shots of the restless Lapwings. 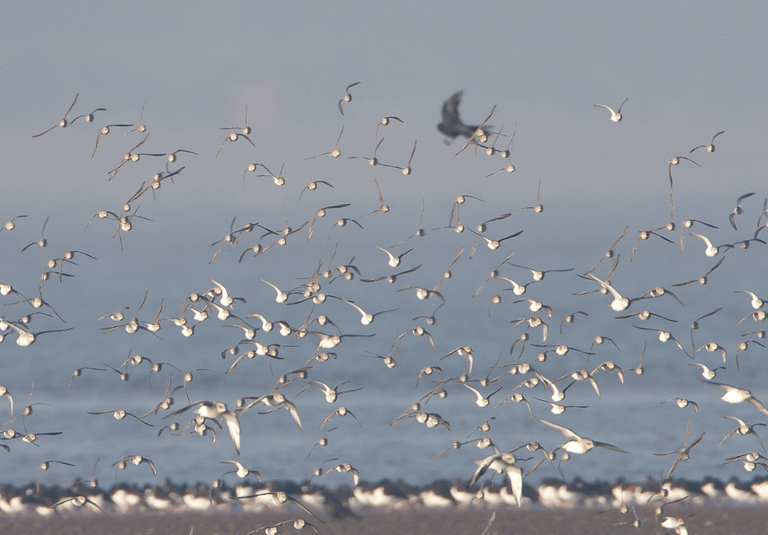 The bright sunshine was allowing me to shoot at fast shutter speeds, freezing the birds in flight. I am happy with the results I got from my time with these birds, no doubt I would have obtained better if I had got closer to them, but then I would have run the risk of disturbing them and cutting short my photography session and, more importantly, causing the birds to burn off vital fat reserves. By staying on the prom I also got to talk to the occasional passer-by about the birds. People were curious about what species were present and why they were resting on the rocks. It was good to show them these special birds, either through my binoculars or on the rear review screen of my camera. This is something else that I like about birdwatching. It is very democratic and largely co-operative. The birds are there for us all to share and enjoy, information on what’s about is distributed by word of mouth or via the internet. This makes the actions of some birders/photographers even more frustrating. Others will have missed out on photo opportunities or sightings due to their actions. This selfishness has no place in our hobby. The following day I am told of some Waxwings close to my house. As I pack my kit to go and look for them I am nervous. I shouldn’t be but I am. I’m apprehensive because if the birds are there I will want to photograph them, but because of the actions of others I will be scrutinised to see if I am behaving properly. If I do get the chance to get some pictures I will be wondering if anyone is watching me, thinking that I am going to disturb the birds so I can get that killer picture. Their gaze burning into my back as the shutter fires. I know you shouldn’t tar people with the same brush but it is inevitable after incidents like Sunday. As it turns out the Waxwings have left by the time I arrive and my camera stays in the bag. Strangely I am almost relieved; it feels like a bad time to be a wildlife photographer this week. Wildlife photography has taught me so much about the natural world, above all the need to conserve it. We can all do our bit, locally, nationally or internationally. We should all have total respect for these birds. Excellent! I've only recently started 'birding' and I'm not oone really, just someone who enjoys watching the natural world and photographing birds etc. I'm always really nervous when near birds- how close is too close? The other week we were on one of the north Anglesey beaches watching choughs that were completely unconcerned abot our presence, landing and feeding only feet away. Their choice so it's ok. It's a tricky balance. 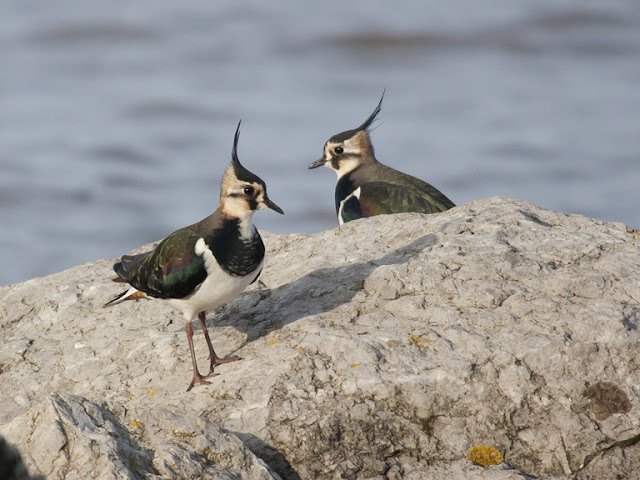 BTW your posts are the best I've come across for birds in north Wales/Deeside. Keep it up Matt!